When is the Celebration this year? Forums > Fan Gatherings > When is the Celebration this year? It's possible they could be planning on something but would 3 months or less be enough advanced notice? I'd really love to start planning for this but can't find any info, besides possible dates, anywhere. 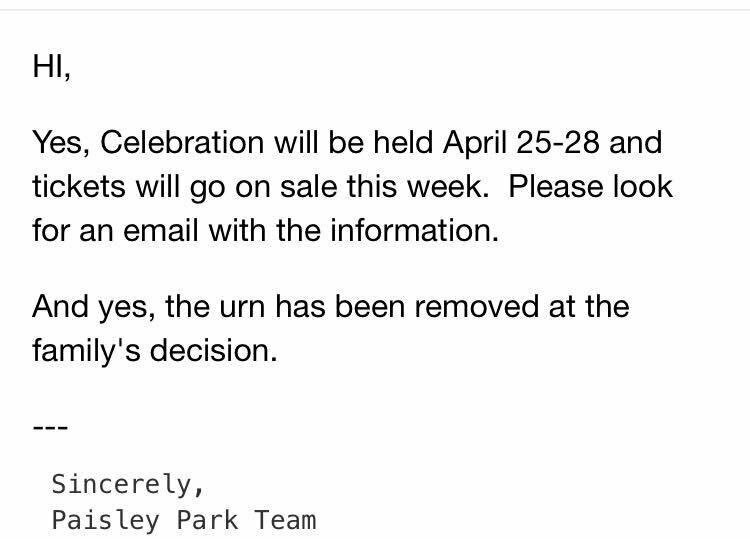 Found this from an email from Paisley Park back in June. No dobut they will have tracks for each day, like previous ones. We are pleased to announce that Celebration 2019 will take place at Paisley Park between April 25-28, 2019.
passes will also include a ticket to PRINCE: In Concert on the Big Screenwhich will be held on Friday, April 26 at The Armory at 8PM. The concert will feature remastered and never-before-released audio and video of Prince accompanied live on the The Armory stage by a super-group of musicians who performed alongside Prince throughout his legendary career.